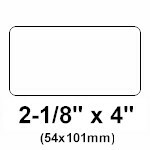 2.125 inches wide by 4 inches long white direct thermal shipping label on roll with 1″ core. Compare to Dymo part # 30323 or Seiko part# SLP-SRL. 220 labels per roll, $17.80 per roll, $80.909 per thousand, 6 rolls per carton and sold by the carton.